Gaza in cease-fire: What Palestinians think of Hamas now, and what that means for Israeli policy. Relax the blockade, and Gazans might credit Hamas. Keep the blockade, and Gazans might erupt. Palestinians salvage items from the rubble of destroyed buildings in part of Gaza City’s al-Tufah neighbourhood as the fragile cease-fire in Gaza entered a second day on Aug. 6, 2014. Since the onset of this week’s cease-fire in Gaza, thousands of displaced Palestinians have returned to their homes to assess the damage. Many have been interviewed about their reflections on the war. The interviews, combined with previous surveys, suggest a dilemma for Israel. From the standpoint of deterrence, Israel has every reason to maintain its blockade of Gaza. But if it does, Palestinians’ anger at militants over the war might be erased by their anger at Israel over the blockade. In the long run, that helps Hamas. Before I get to the interviews, it’s useful to look at two scientific assessments of public opinion in Gaza prior to the war. The most recent is a mid-June poll commissioned by the Washington Institute for Near East Policy. It found that 70 percent of Gazans thought Hamas “should maintain a cease-fire with Israel.” Eighty-eight percent said the Palestinian Authority, which had already welcomed Hamas into a nascent unity government, should “send officials and security officers to Gaza to take over the administration there.” Fifty-seven percent said Hamas should accept a Palestinian government that recognizes Israel and renounces violence. With those assessments in mind, let’s look at the patterns in the interviews conducted in the past few days. 3. Gazans see the war as a loss. Hamas calls it a victory, but many Gaza civilians who’ve been interviewed say the opposite. “The Israelis have hit us really hard this time. They destroyed us,” says one man. “The only thing we gained is destruction,” says another. “What did anyone gain by this?” asks a third. 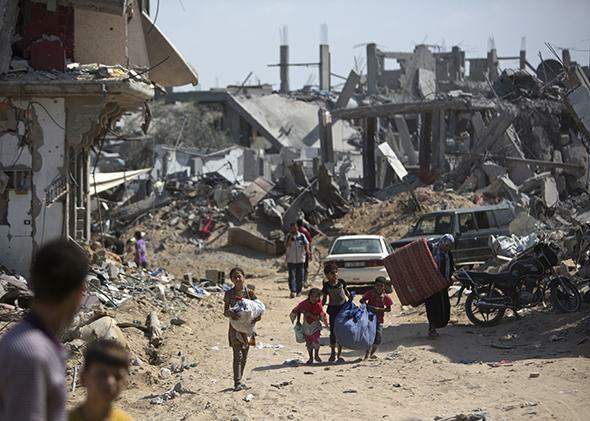 Many residents, surveying the death and damage, call this the most devastating of Gaza’s recent wars. Some ridicule the rhetoric of militants. “We have defeated the occupation, thanks be to God,” jokes a young man in Rafah. 6. Gazans will judge the war based on postwar concessions. As things stand, they see the war as a loss. But that calculation assumes the continuation of the blockade. “All the industries are dying, and there are no jobs for the young,” laments a Gaza City man. “It’s a kind of suffocation. So if we can’t change that, this has all been for nothing.” Another resident makes the same point: “Maybe if we had gotten some concessions, it would be worth it. But we got nothing.” If Hamas does manage to extract relief, its supporters will feel vindicated. “After a month of war and the achievements of the resistance and what they did for us, God willing, they’ll open up the fishing … and they’ll lift the blockade,” predicts a fisherman. Taken together, these themes create an unfortunate set of incentives. If Israel relaxes its grip on Gaza’s borders and gives the people of Gaza a sense that the war paid off, they’ll be more likely to credit and support Hamas. From the standpoint of deterrence—the principle that has always driven Israel’s thinking—that’s a disaster. So Israel has every reason to concede nothing. Let Gazans absorb the pain. Maybe they’ll turn on Hamas. The best argument against this response, with respect to Israel’s strategic interests, is that the cost of granting concessions is less than the cost of not granting them. Yes, if Gaza’s borders are opened, its people will celebrate. Yes, they might applaud Hamas, and they might conclude that belligerence works. But if the borders aren’t opened, the people might radicalize and explode. That’s the warning in those prewar surveys about the political effects of the blockade. Hamas and its violent inclinations might gain more support from the blockade than from its relaxation.